We help our clients to harness the wide reach of the Internet by designing solutions that help them market their products to a wider audience. GS TECKNO has a vision to empower clients with marketing tools that help their business grow. You can leave behind all your doubts about industry standards and crucial designing process to us. Our professional design services will take care of all these specifics and let you concentrate on your core business. We immerse ourselves in the mindset of our clients to gauge their needs and fulfill their expectations. 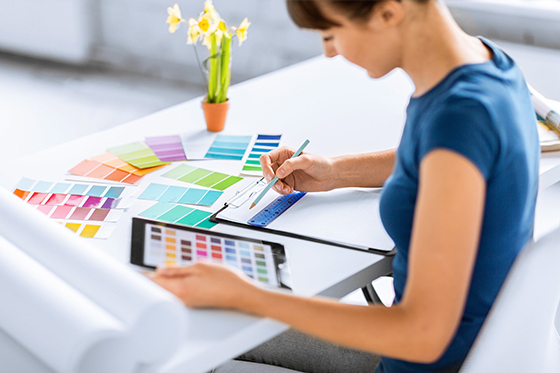 Creative designs tell your brand’s story through appealing visuals. Businesses always benefits through visual mediums, like, crisp colors and expert creativity to attract customers, instantly. But getting the right kind of creative services is probably the most challenging task in this whole process. Therefore, whether it is a small company or a big establishment, creative design services are crucial for every organization. There is a lot that goes into building a brand image of your organization, and GS TECKNO has all the arms and ammunition to get the work done cost-effectively. Every business wants to be a customer’s first choice. Building and managing a brand can play a significant part in making that happen. The concept of a brand extends far beyond just your company logo to your business’ core values and to every interaction you have with customers and suppliers. In effect, your brand creates and maintains your reputation and so reflects your customers’ experience of your organisation. Creating a comprehensive visual identity that encompasses your unique graphic language and style, including typefaces, colours and art. Designing logos and symbols for your website, business cards, letterhead and product packaging. Writing branding guidelines that help your employees, contractors and partners align with how your brand ought to be promoted and used. GS TECKNO is ready to reflect your uniqueness, professionalism and fame with the help specially designed business cards, logos, brochures, etc. We work hand by hand with you taking into account all the details and requirements of yours. Besides, we use our broad experience, professionalism and knowledge to make you surprised seeing the result of your ideas and our efforts. GS TECKNO will help you get world-wide recognition and respect which will lead you to reaching personal goals. CORPORATE PROFILE / CATALOGUES / LEAFLETS design needs to be both informative and engrossing. Our Works are designed to stand out from the clutter and take you forward. We create corporate profiles, brochures to promote sales, marketing tools and product catalogues. We at GS TECKNO take complete responsibility and manage the creative process from concept development to printing, together with professional photography, engaging content writing, creative typography laid out to perfection. We also develop digital brochure design for online sharing and for emailing.